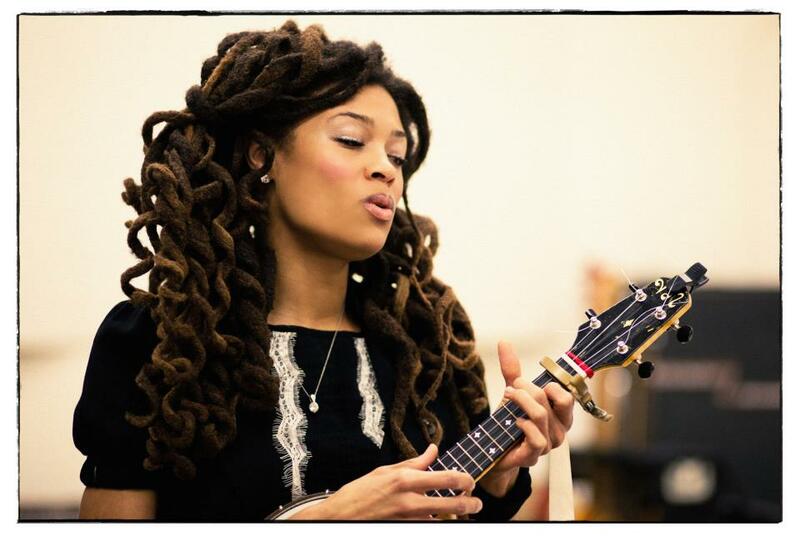 Speakers in Code: Valerie June: "Recording definitely changes everything. It's not easy to let go of things, just like in life." Valerie June: "Recording definitely changes everything. It's not easy to let go of things, just like in life." Tonight, Valerie June will be performing with Sharon Jones and the Dap-Kings at The Pageant in St. Louis in support of her latest album, Pushin' Against a Stone. She'll also be performing a brief set at Vintage Vinyl around 3 PM 4PM. We selected "Workin' Woman Blues" as one of our Best 150 Songs of 2013. Let's have a listen now. We recently talked to Valerie over the phone about the current tour, singing, her album, and her next album. We're about almost two weeks into it. And what we're doing is very fun, because it's a great contrast to what Sharon does, but people seem to love both of us. Her fans have become ours, and our fans have become hers, so it's working according to plan. (laughs) I have a trio -- drums and bass -- and sometimes Binky from her band, he plays guitar with me. She has a big band, lots of people on stage, and it's different, it's cool. I worked with so many different musicians and producers on the record, and it just sounds like working with Booker T. Jones, or Kevin Augunas, or Dan (Auerbach of The Black Keys), or the Hungarian musicians. So, each experience was different, and that's why the record is so expansive, because there are so many different energies involved. So, some things are really big sounding, and some are really sweet and simple. It was a journey and still is. We were a singing family. Musicals -- like, television musicals -- were a big part of our lives. Sound of Music, and Walt Disney sing-a-long stuff, we just knew every single word. And each person had their part. (laughs) We would do shows -- we would all stand in front of the aunts and uncles. It was fun. On her song "Somebody to Love"
I had the ukulele-banjo, I call it "the baby," and I had it for probably two years, and didn't know anything about it. I always thought, "I don't know about this thing -- it's a toy." But then I went to Hungary, and I was playing around, and I was just playing that song, "Somebody To Love." And I played it and wrote it, and then I left. Went back to New York, and I remembered it, and broke out my little zoom recorder. So I brought it out, and I recorded a raw version of it -- this was at the very end of the record -- and I heard all the different voices, so I put all the little voices down on my zoom. And it was so fun! Because when I write the songs, and I hear the voices there in the raw form, I think that's a really beautiful time, too. And then I play it and it gets produced -- that's a totally different way that the music goes, and it's interesting. The raw form of a song is sweet. And now, when I play it live, I play it different than when I played it on the record. It just changes every single time. It's a sweet little tune. Oh, I have another one. I'm just making time -- hopefully in the summer we'll get in the studio and color it up. I really don't know what's going to happen next -- not a clue. People ask me all the time, but I really don't know where a song will go. I know what song I want to record, but I don't know how it's going to sound when I get done. Recording definitely changes everything. It's not easy to let go of things, just like in life. It's not easy to just say, "okay, I'm letting go." But, the more I get in the studio, the more I learn. It's a lesson. And they're everywhere, hiding and popping up. Valerie June with Sharon Jones and the Dap-Kings. Tonight, March 2nd, at The Pageant. Doors at 7. Tickets: $27.50. Valerie June will also be performing a brief set at Vintage Vinyl at 3PM 4PM today.